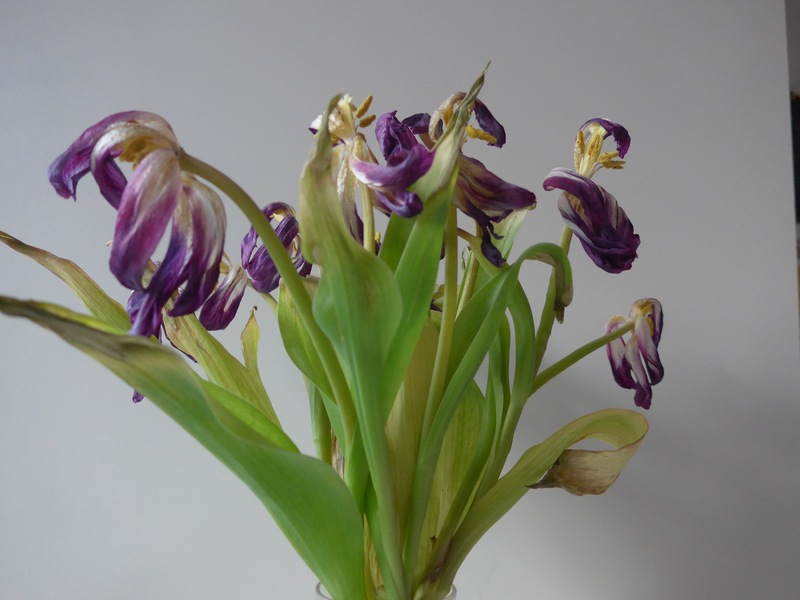 Last week I treated myself to a bunch of tulips from the market, pondering for a long time on what colour to choose. They have been really fun to draw and I downloaded an audiobook from the library to keep me company Tin Can Tree by Anne Tyler. I use my iPad to record the flowers before I start drawing because flowers move! shock horror…….and they even die. But, but, but……….this bunch is just as beautiful and I am very tempted to have a go at drawing of these just as they are right now. I have been considering how to progress my skills and continue with a regular practice and I think I have found a way. I am focussing my attention close to home……my own garden in fact. I have been bemoaning the fact that there are not many plants and they are not very exotic and blah blah blah but in fact they are the plants I have, they are the plants on my doorstep so to speak and the are available all year round – what more do I want?! I am starting a sketchbook and I am going to catalogue and draw each plant that grows in my garden (as I look around I can see at least thirty different species) which should keep me busy for a while. Each plant will be drawn as it changes through the seasons. I suspect it will be a never ending project as I am already buying new plants and then there will be the vegetables we grow, the bulbs we hope to plant, the herbs, the houseplants, and the bouquets (feel free to send them whenever you like). I might even try some calligraphy so that the notes will also look decorative. I have found a brilliant web site for cataloguing plants (Plantsmap.com) which appeals to nerdy me – it is FaceBook for plants and I have started adding my plants and collections to help keep track. Full moon at night and a sunny morning what could be nicer? 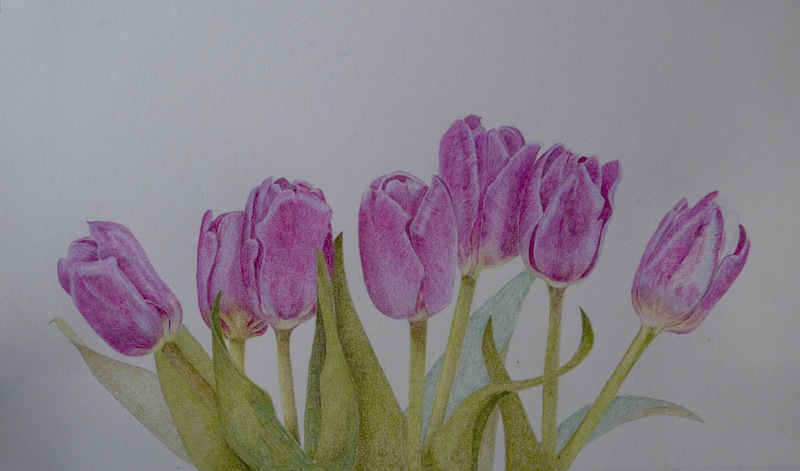 This entry was posted in botancial art, Draws Shoots and Leaves and tagged colored pencil, coloured pencil, polychromos, prismacolor, tulip on February 25, 2016 by Draws Shoots and Leaves. This entry was posted in botancial art, drawing, Draws Shoots and Leaves and tagged colored pencil, coloured pencil, drawing on February 11, 2016 by Draws Shoots and Leaves. I have signed up again with Janie Pirie for a coloured pencil class and we are now several weeks in. She provided some coloured plates from the 1950s / 1960s and we were to select some flower heads from these plates, to make a composition. This is not how I usually work but I am interested in learning from Janie. I chose these three plates for my flower heads mainly because I wanted some unity in colour as the three flower heads are very different structures. Left to right, I am using the red/yellow chrysanthemum, the centre salpiglossis, and the bottom open tulip. Strange to use already drawn images as source material. Here is the beginning of the open tulip, I have arranged the flower heads with this one at the bottom the chrysanthemum in the middle and the salpiglossis at the apex, and hopefully the similarity of the colours will give some sense of cohesion to the very simple composition. This entry was posted in botancial art, Draws Shoots and Leaves and tagged botanical art, colored pencil, coloured pencil on February 2, 2016 by Draws Shoots and Leaves.